It's the end of a weekend well spent and I'm so ready to crawl under my sheets and pass out. I went out Friday evening with two of my college friends. One of them lives in midtown and she just bought a hamster who she affectionately named Rumple, after Rumpelstiltskin from the infamous fairy tale. I'm pretty sure I obsessed over him for a good hour while he tried to escape the wrath of my hands. Saturday was full of errands with my roommate, Crystal, since we had some apartment necessities to pick up. She rented a Zipcar and we traveled to this huge shopping center about fifteen blocks away from our apartment that had a Costco, Marshall's, and Target. It was pretty much shopping heaven, to say the least. Now we finally have a lamp for our living room (it only took us three months). The last thing on our list is a cheap dining room table since our dining room currently houses Rob's bike. After a busy day running errands, we let off some steam and headed downtown to Phebe's with a handful of friends for a few drinks. Phebe's ended up being much wilder than we expected with biddies everywhere. We managed to make it out alive (although Crystal hurt her knee) so I would call it a successful night overall. I spent my Sunday filling my stomach with delicious foods. I met up with a few co-workers to get Dim Sum in Chinatown. We went to Golden Unicorn (it was my second time there) and I would highly recommend it if you're ever craving some delicious Asian food in the city. The wait is a bit long if you're there during prime lunch hours, but it's so worth it! Then after Skyping with Jeremy for a bit, which always puts a smile on my face, I caught up with an old high school friend over four-and-a-half star Thai food. P.S. I am aware that I wrote an essay about my weekend, as if everyone wants to read an hourly log of my life. 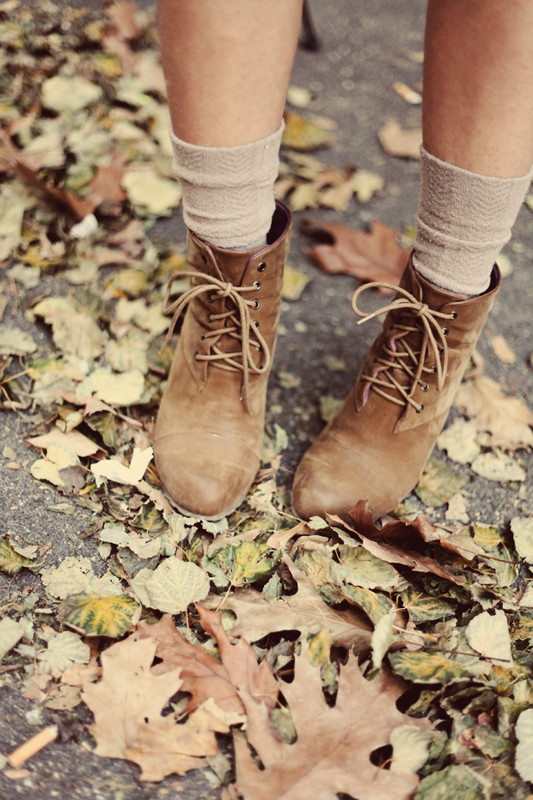 Love the boots, reminds me of Fall. Hey, I like when you write essays! 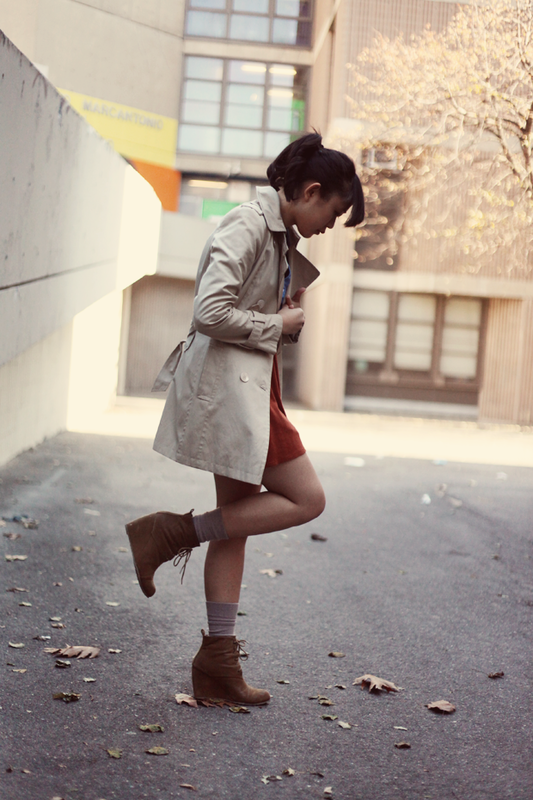 It's fun to hear about other people's lives haha :) I love the blowfish booties--want a pair so bad!!! 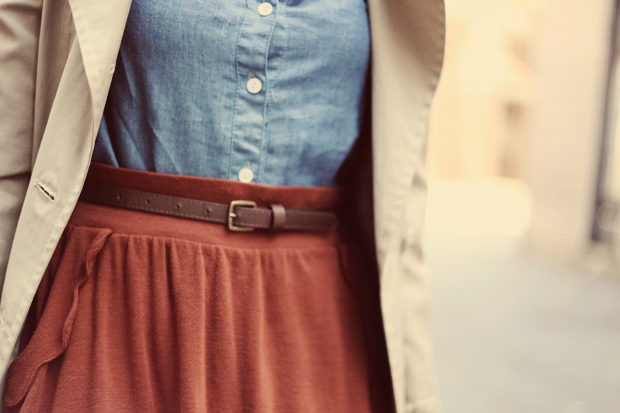 You look adorable and perfect for fall. Marshalls and Target in one place together are heaven indeed! I WANT TO GO! I want your trench! And I love your socks. :) Sounds like you had a productive and fun weekend, which is always a good mix. aaahh.. the first and last photos pretty much sums up what i love about this post!! 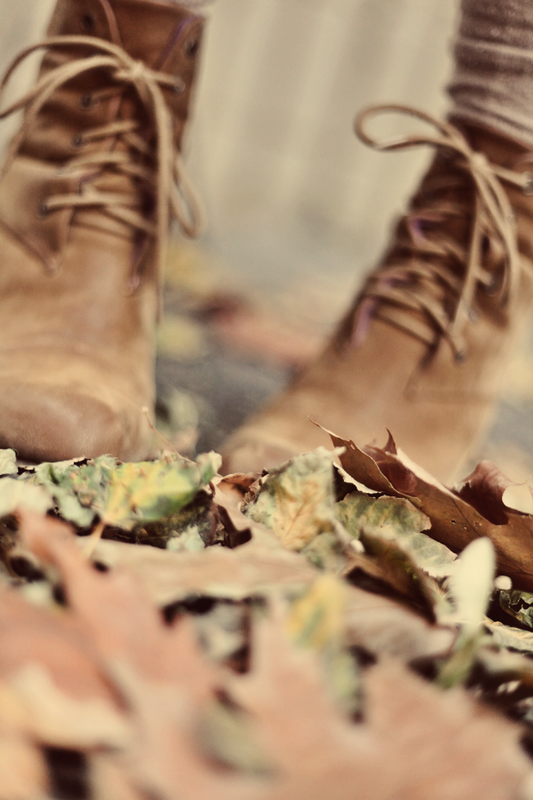 the boots and the fall leaves!!! :D i can almost hear the crisp leaves as you were walking on them. haha! love that last photo! :) and sounds like you had a great weekend! Jenn, your boots look so rad! Love them! I love hourly logs of your life. Those leaves are really cool. They look like hipster leaves! Llllllove this outfit! the colors are so perfectly fall! 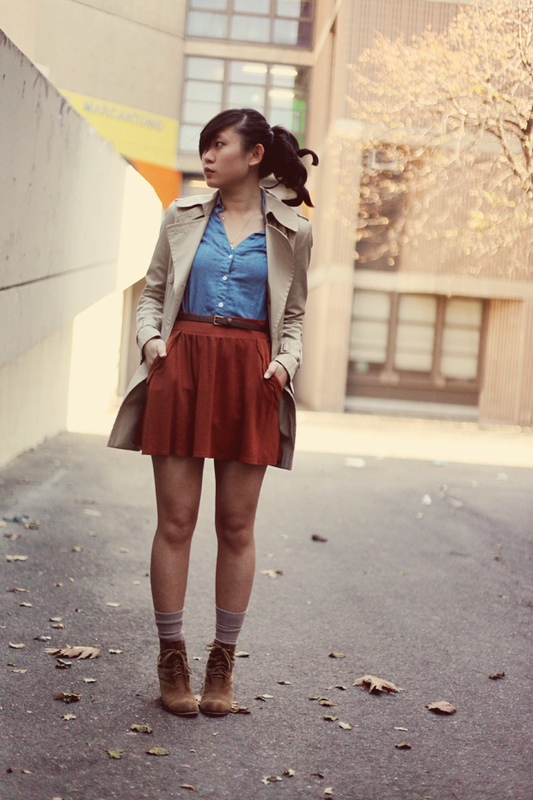 especially the chambray + spicy orange! i love this series of shots :) You're so beautiful!